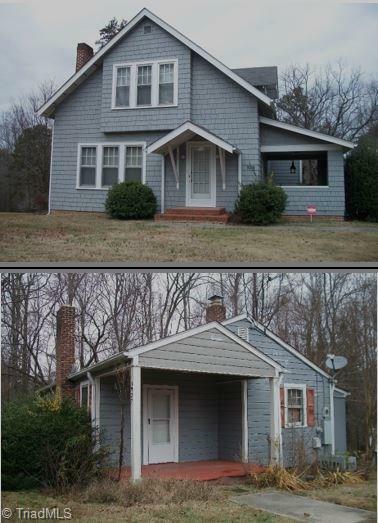 5927 Shallowford Road, Lewisville, NC.| MLS# 912767 | North Carolina Farm and Vineyard Specialist Patria Properties Inc.
3.53 ACRES W/TWO HOMES Restore the charming 1-l/2 story w/delightful sitting porch & guest cottage. Lots of renovations needed including wiring, plumbing, septic, etc. Sink & tub water run into backyard. Forsyth Co. has no septic report on file. Please see adjoining properties MLS#'s 912756 & 912863 for potential development. The 3 listings combined offer 936 ft of road frontage w/5.26 total acres for $404,200. SOLD "AS IS" CONDITION Public sewer located across the street - Shallowford Reserve.